An interview with Iklal, a member of the Shia community who are being persecuted by the local government and intolerant groups, published by the Asian Human Rights Commission. Background: Since 2004, the Shia community in Sampang, East Java, has been subjected to discrimination and persecution by intolerant groups. Last year, an attack against the religious minority group resulted in the death of one person and injuries to some others while dozens of houses were burned. In addition to being attacked by the intolerant groups, the Shia community has also been forcibly evicted from their hometown by the government. One of them, Iklal, narrated his experience and expectations of the government through the AHRC. 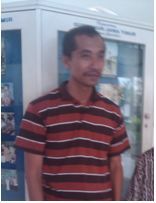 (Photo of Iklal, courtesy of KontraS Surabaya). How did the persecution and discrimination against the Shia community in Sampang start? At first we lived peacefully side by side with the surrounding community. There are 67 families which are members of our community and most of us are farmers. We plant rice, corn and other crops, depending on the season. As far as I know, the persecution and discrimination against our community began in 2004. I do not know how or from where, but at that time a lot of people claimed that Shia is deviant or not of the teachings of Islam. The peak of the accusations came in 2006 when about 5000 people and religious leaders came from three districts and staged a demonstration around our homes and schools located in Karang Gayam Village in Sampang, East Java. They asked the leader of our Shia community in Sampang, Mr. Tajul Muluk, to halt all activities of the Misbachul Huda Islamic boarding school which he ran. When the demonstration was ongoing, Mr. Tajul Muluk was forced to sign an agreement saying that Shia will not be taught in the area. At that time the police promised to allow Shia to be taught if Tajul Muluk signed the agreement and that the signing was simply to pacify the demonstrators. However, since then we have been harassed by local residents as well as residents of other villages on the basis that we are followers of a cult. What kind of harassment that have been experienced by the Shia community? The harassment is very alarming. We have been treated cruelly and subjected to violent attacks by intolerant groups twice in 2011 and 2012. To be precise, on 29 December 2011 my house as well as my sister’s and the Islamic school we ran were burned by a mob of around 300 people. As a result of the attack, approximately 220 of us, which included toddlers and the elderly, were evacuated to the Sampang Sports Hall (GOR). We stayed there for 2 weeks with minimum facilities. The food provided by the government was very limited and we could not hold our activities as usual. The second attack was on 26 August 2012 when we were about to take our children to boarding schools outside the city in two cars. On the way we were confronted by a mob coming from the village where we were staying as well as those who were from outside the village. They did not want our kids to be sent out to other schools because they believed we are educating them to disseminate the teachings of Shia. As a result of this attack, a member of our community named Hamana (50-year old) died. Seven people were critically injured and dozens of others were injured. Many of our houses were also burned by the mob. How did the government react to such attack? After the second attack, the central government only visited us. They were represented by the Chief of the Indonesian National Police, the Commander of the Indonesian Military, the Head of the State Intelligent Agency as well as the Minister of Religious Affairs. They were accompanied as well by the Regent of Sampang and some other provincial government officials. Following the second assault, many of us fled to the woods to save ourselves but then the police and the military made a sweep search and took us to the GOR which has been transformed into a refugee shelter. Since we moved to the GOR, there has been no attention given by the government. Even the Regent of Sampang and the Governor of East Java have never visited us. About three months ago we were visited by a member of the Presidential advisory council and he said he would help us to seek justice so that we would be able to go home. Yet until now there is no concrete follow up after the visit. How was life like in the refugee shelter? We lived in the refugee shelter for about 10 months. We did not get adequate services, especially in terms of food. The food we got was not very appropriate. In addition to it, the education and health service were lacking. The local government only provided education and health service for two months. I felt very uncomfortable because I could not do anything. Even to take care of several administrative issues, for instance taking ID cards and other important documents in the homes we had left, we had to do it ourselves without the government providing any attention or assistance to us. This is also the case in terms of the security of our belongings in the house — we do not have any guarantee that our fields, farms and others are safe. What did happen after your 10-month stay in the refugee shelter? On 19 June 2013 I was taken to a police station for questioning. When I arrived, there were already community leaders claiming to be members of Badan Silaturahmi Ulama se-Madura (BASRA) as well as some government officials. During the meeting I was forced to consent on the plan of the Shia community relocation as the GOR would be used as the venue of collective prayer (istighosah) for Islamic leaders (ulemas) in Madura. On 20 June 2013 about 8000 people entered the GOR’s front yard to forcibly evict us and to conduct the istighosah. At that time the local government and ulemas continuously pushed us to agree to the relocation. Finally we were forcibly relocated by the local government from the GOR to flats located in Sidoarjo, East Java. In the flats we also have complaints on the service provided by local governments. Food and other services are still minimal. What do you feel about the relocation? Actually we all refused to be relocated. We just want to go back to our hometown. We are not able to work and our children cannot play and learn as usual in the flats. Place to live, for us, is everything. All of our activities and business that we do for living are all in the village. I have a farm of about half an acre which I take care of everyday. I go there to plant rice, corn and other crops. Here we do not have any assurance of life — when we may come home and when we can conduct our activities as usual. What do you expect the government and the public to do? My expectation to the government is to give us certainty on when we will be able to return to our homes. Indonesia is a state based on rule of law that upholds justice. We also have the 1945 Constitution which guarantees the right of every citizen to live and have a place to stay. I am worried about the safety of my fields and farms as well as other valuables during this time. I have to get guarantees from the government on the security of things that are precious to us. The most important thing is that we can return to our home. To the entire community, I would like to say that we all should live and love peace, and no longer use violent means in solving problems. I do not have any resentment against anyone, not even those who have burned my house and attacked me. Let us uphold the 1945 Constitution. I just want what I have experienced not to happen again in the future.